One of the most versatile microfiber pads on the detailing market! The newest addition to the Uro-Fiber Pad line, the Uro-Fiber Finishier Pad was designed if you like the overall performance and versatility of Buff and Shine’s Uro-Fiber pads (with the “black and white” fibers), but you felt like you needed just a bit more fine-finishing capability, then you will appreciate Uro-Fiber Finisher Pads. Buff and Shine listened to the feedback from end-users of Uro-Fiber pads and engineered a new microfiber pad with a standard pile height and shorter profile that provides great finishing results, especially on softer paints. Buff and Shine Uro-Fiber Pads feature a low profile, making them perfect for use with virtually any machine polisher. While Buff and Shine Uro-Fiber Pads were designed for long throw or high action polishers originally, they can successfully be used with any type of polishing machine. With a total thickness of just 3/8”, Buff and Shine Uro-Fiber Pads will conform to the needs of its user. 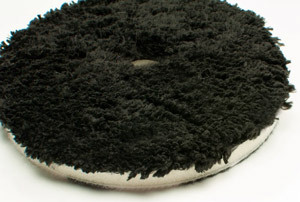 The foam interface that separate the microfiber pad from the backing plate is made of an open cell foam and allows for working large, flat areas just as well as contours. Thanks to the chemical and heat resistant adhesive that holds the Buff and Shine Uro-Fiber components together, these microfiber pads excel in durability and hold up under even the toughest polishing sessions. Available in different sizes, you’ll be hard pressed to find a paint polishing or correcting task that CAN’T benefit from a treatment with Buff and Shine Uro-Fiber Pads.